Team Jefferson Starship reviewed this attraction on October 22, 2016. The Akron Haunted Schoolhouse and Laboratory is an old-school haunt that employs some very modern and impressive special effects. Hand-built with loving care inside what is most probably a legitimately-haunted set of buildings, this is a must-see haunt for the whole family. 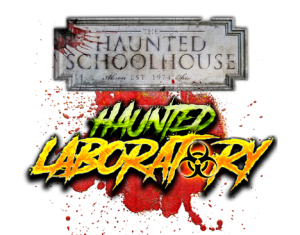 The Haunted Schoolhouse and Laboratory offers scares for all ages as it covers both classic and modern horror elements over seven floors of terror. The team here has been perfecting their haunt for 43 years and they have some pretty big and hush-hush projects in their future! Be prepared to climb stairs, wind through dark hallways and be shocked by the intricate sets and unexpected monsters. Visitors to the Haunted Schoolhouse and Laboratory are in for more than a few surprises from the ghouls that roam its halls. Our group was lucky enough to get a look behind the scenes and find out that over a hundred doomed souls work in between the two houses… waiting in the dark for passers-by. Despite its size, the creatures here are a tight-knit family and they take great pride in causing fear and mayhem. Look closely and you’ll see memorials to one of the founding fathers, Don, spread throughout the haunt. The dentist drilled fear into us, the bus driver drove up our heart rates and the line was kept entertained and busy with creeping creatures. Some monsters may want to expand beyond simply screaming or jumping, but we were delighted to find quite a bit of interactivity and wit from the haunters we spoke to. The Haunted Schoolhouse and Laboratory was quite mixed when it came to costuming. Every outfit was perfectly suited to its setting and we didn’t spot anything that looked haphazard or last-minute. There is a disproportionately-high usage of masks, some of which were untucked, but they were still theme-appropriate. The makeup that was used was highly effective, truly horrifying and one monster in particular managed to give the impression of a mannequin before jumping to life and terrifying us. We cannot give enough praise to the monsters in the final act, all of whom were believable to the extreme and fascinatingly grotesque. Our review team was met very early on by line entertainment, clear signage and a well-ordered queue. The employee at the ticket booth was bright and lively, the management was informative and helpful and staff inside the haunt were very attentive. We did arrive at the end of the night and there were a few reminders to step lively since they were closing soon, so it’s suggested to arrive with enough time to wander at your leisure. There’s a lot to see and you need the time to see it. Pay close attention to warning signs, as some rooms have restrictions for people with certain medical conditions. The atmosphere at the Haunted Schoolhouse and Laboratory is awe-inspiring and unforgettable. The two buildings have a wealth of legitimate haunted history and the resonance of the place reflects that. From the dread inducing historic face of the Laboratory and Schoolhouse to the 10 foot Tesla Coil on the roof, it’s impossible to not enter the first room with a heightened pulse and a paranoid feeling. We were delighted at the decorations, the sets and the setting. Akron’s Haunted Schoolhouse and Laboratory is an old-school haunt with unique and hand-made special effects. On our walkthrough, we were given insights into the process of building and creating this shocking haunt. Engineers are on site every night to fix anything that might go wrong with the tricks and treats that await all guests. Some rooms could benefit from more lighting, but that might just be our greed talking to see more of the amazing details packed into this haunt. Keep a close eye on the ground when you cross the catwalks to see what is possibly one of the most unique and incredible effects we’ve ever witnessed in a haunted house! We were told that there is not necessarily a unified theme between the Schoolhouse and Laboratory. The Schoolhouse shoots for an old-school feel and achieves it handily. The house is filled with themes and pieces from classic horror films and one of our team members was terrified to come face-to-face with the first monster that ever scared her on screen. The Laboratory inspires dark dread with disquieting characters, intense effects and a wide variety of scenes. The change in topic from room to room is surprisingly smooth for the most part and managed to hit almost every fear on the map. More than once our team was made to jump as we traveled through the winding hallways of the two buildings. Ahead and behind us, screams rang out from terrified patrons. The gruesome ghouls are very effective at their jobs. There was a bit of a repetitious pattern that we picked up on that could use some changing up, but shock was not in short supply here. We were especially pleased with the performances in the Laboratory and found that the finale was a nonstop thrill ride packed to the brim with monsters and frights. The Haunted Schoolhouse and Laboratory has multiple ticket options for patrons. Thursday and Sunday nights are $13.00 a house or $22 for a combo ticket if bought online. Friday and Saturday nights are $17 a piece or $26 for a combo. Tickets purchased on-site are a bit more expensive so buy ahead and save yourself a little money. The fast pass is $40 for a combo ticket and well worth the price considering the crowd that they draw. It takes about thirty minutes to go through both houses which comes out to quite a deal!